Thanks so much to everyone who has linked up to share your fel food creations! They're so great, I thought I'd take a break from showing off myself to show of your stuff...because it's even better. Then to let you know what's coming, I'll share my secret to the blueberry muffins and later we'll be doing some bread and sandwich fixings, minature canned food (not felt, but sooo cool), bananas, carrots, strawberries, pancakes and fixings, and more (but not necessarily in that order.) Please keep linking up your awesome projects down below! 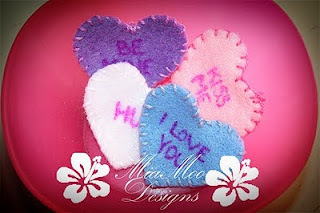 I love how Miss Muffin on Muffins and More made these felt Valentines cookies. She did some great detail work including using French knots for sprinkles. 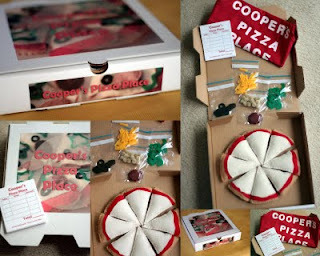 Jamie at Pure Joy made a pizza with a ton of cool accessories. 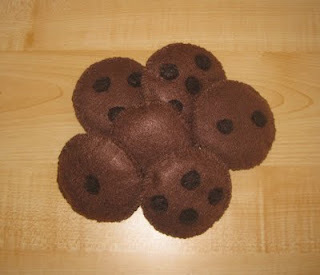 Counting Coconuts has a great idea for combining felt cookies with numbers. Angie on Treasures for Tots as a lot of great ideas for felt food...and a lot of them are No-Sew versions if you want something super simple. 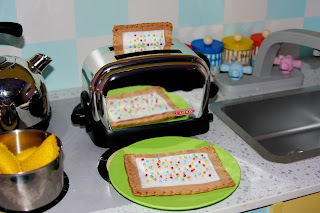 I've successfully used instructions for several kinds of pasta and she makes some really awesome Pop Tarts. I love how she used the beads for the sprinkles. Be sure to check out all her links! MiaMoo Designs has a fun idea for Valentine's Day candy hearts. 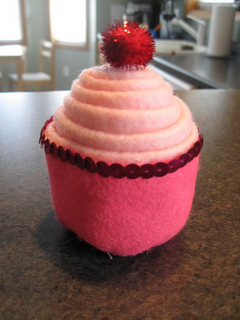 You should also check out the cupcake on Camp Slop made to go with her daughter's Pinkalicious costume. (You've got to click to see the costume.) We love Pinkalicious around here and have done our own activities with it after being introduced to it by Christianne on Little Page Turners. 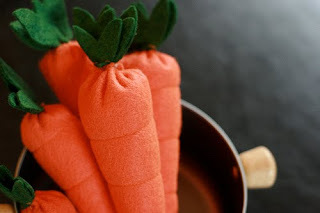 And last, but certainly not least..."i make stuff" has an awesome felt carrot tutorial. So awesome in fact, I'm almost done with four carrots made using her printable free pattern with detailed instructions, so they'll be getting their own post sometime soon. If you go to her actual blog post, it has links to some other awesome felt food she's made. Definitely worth looking around. Finally, keep those links coming! If you've got felt food to share, we want to see it. I'm reposting the same MckLinky here, so just keep adding links and when we have enough, I'll do another highlights post. If you're looking for other places for felt food inspiration, Keeper of the Cheerios has a great list of free felt food patterns. Felt-o-rama also has a great list, and One Pretty Thing just had a Felt Food Round-Up (featuring some of my stuff...wow! I feel so famous. :) Rachel on One Pretty Thing has also done some felt food round-ups in the past, so be sure to look back at her archives. I'm glad you liked the pinkalicious cupcake! Writing a tutorial on how to make it has been on my to do list for awhile. I can't wait to see the all the other fun things you have planned for the cook along! Aww, thanks so much for the mention. I am LOVING your Felt Food Along! Wow, Polly, that's a lot of links! Good job! oh thanks for this post! I just made one of those carrots in like minutes, and it was handsewn. And so cute!!! woowoo, felt food here I come!